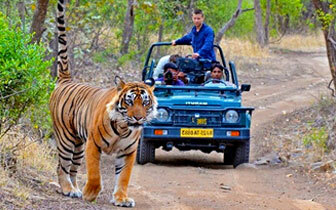 With this unique tour you can catch the glimpses of Indian heritage and beauty within a span of four days. This golden triangle tour takes you an enthralling journey to three of the most fascinating and culturally enriched parts of the country. On these journeys guests get visit the world’s monumental personification of love – The Taj Mahal; they can also spot the elusive tiger in Ranthambore National Park and soak up the spectacular regal heritage of Rajasthan at Jaipur. Guests begin their journey with a grand welcome at the Safdarjung Railway Station, Delhi. 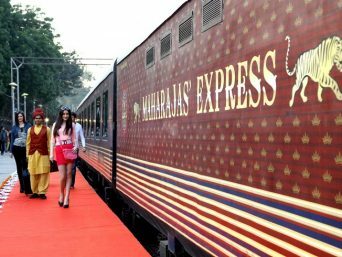 The Maharajas' Express then proceeds to Agra and guests can treat themselves to a luxurious onboard brunch. The luxurious golden triangle tour begins with the alluring city of Agra and guests get to visit The Taj Mahal- the iconic cenotaph of famous Mughal queen, Mumtaz Mahal. Guests can then either choose to return to the comforts of Maharajas' Express or can get a closer look at the Mughal era with "Mohabbat-e-Taj Show" or visit Itamd –Ud – Daula or Spa at a 5-star hotel as an optional activity. 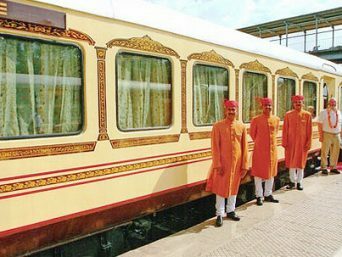 With a sumptuous on board dinner the palatial train stays in Agra only. Begin your day with an onboard breakfast and treat yourself to global delicacies at train's thematically designed restaurants- Mayur Mahal and Rang Mahal. After breakfast guests proceed to visit the Agra Fort" or may choose to visit the "jewel box" of Mughal architecture, Itmad-Ud-Daula as an optional activity. Afterwards guests return to the comforts of Maharajas' Express for an onboard lunch and our train leaves for Sawai Madhopur. Upon arrival in Sawai Madhopur guests proceed for an exciting game drive at Ranthambore National Park, the second city in Treasures of India tour. After return from the game drive guests enjoy an Indian Evening on-board followed by a lavish onboard dinner. 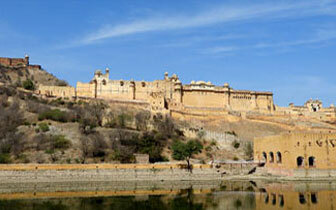 The Maharajas' Express then leaves for the next destination in its golden triangle tour- Jaipur, the pink city of India. After the on-board breakfast guests can proceed to visit the Amber Fort or may choose from the optional activities such as Spa facilities at a 5-star hotel Exclusive private shopping tour Golfing at Rambagh Golf Club Visit to the grandiose City Palace and The Observatory, colloquially known as JantarMantar and is based on traditional Indian principles of astronomy. Later guest return back to the comforts of Maharajas' Express and treat themselves to an on-board lunch. Post lunch you may relax onboard or may choose the above mentioned optional services (subject to availability). Post-lunch guests proceed to City Palace or Jai Mahal Palace for an exclusive Elephant Activities where guests have an opportunity to decorate them with vibrant paints, feed them or take a regal ride. The Treasures of India tour also showcases the beauty of Indian culture and on the last night guests can enjoy an Enthralling & Traditional Kalbelia dance performance followed by a splendid dinner. 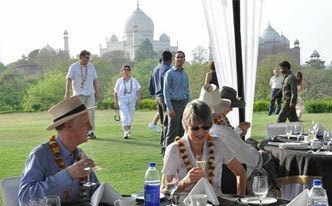 The Maharajas' Express then leaves for Delhi, the terminus of the luxurious golden triangle tour.